This amazing picture of Spaceship Earth at EPCOT Center was taken by my father in the late 1970's. The original picture was a Poloroid so the quality isn't very good but, if you look carefully, you can even see the Monorail tracks going around the sphere. This picture remains a mystery to me. 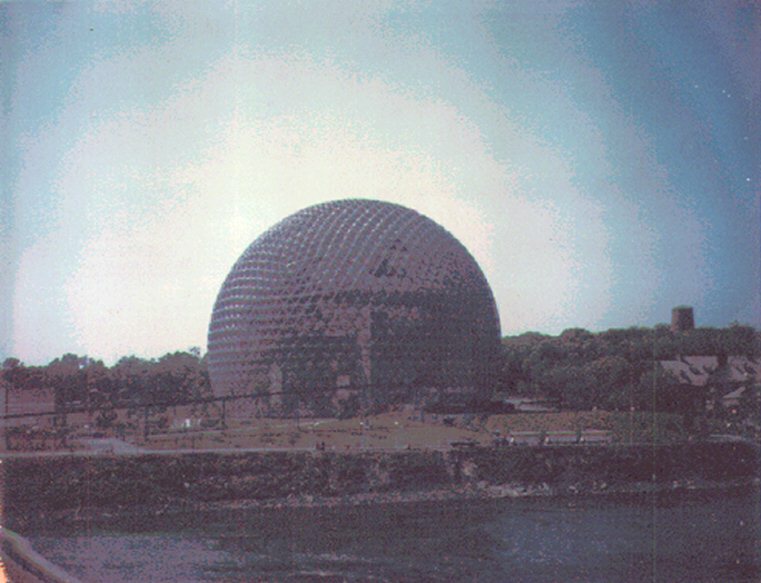 I found this with the old photo of the EPCOT ball and, as I knew my parents stayed at the Contempory, it appears to been taken from there looking towards the Polynesian Hotel. What the other buildings are is anyone's guess. If anyone visited Disney World in it's early days and has any idea of what is in this picture, please Email me and, if you like, I'll include your comments in these pages. Thursday, September 12th dawned partly cloudy with some morning fog. Used the first of our breakfast coupons from the Fall Fantasy package. I highly recommend getting this. Used probably � of the coupons from the coupon book as well as the breakfast vouchers. You could actually have breakfast with the Disney Characters every day if you wanted to. And then it was off to Typhoon Lagoon!! 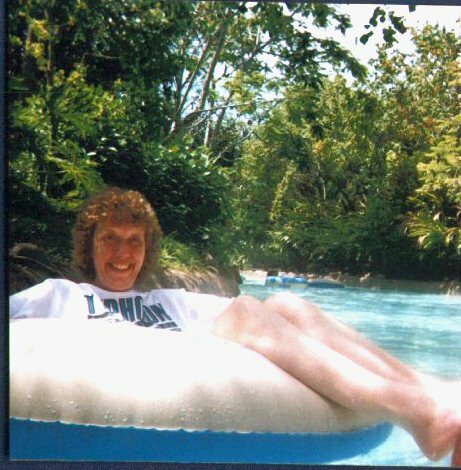 You must understand that Typhoon Lagoon is what helped me make it through the worst winter on record last year. Everytime we got another inch of our 107 inches of snow, I would say to myself, "Think about TL and floating around the river". We got there about 5 minutes before the park opened and walked right in. My husband was amazed at the size of the waves so we went in there first. Then after buying a water proof camera, we went into the river and took pictures of ourselves getting drenched by the water fall. Great fun! Went down Gang Plank Falls and then actually took some time to relax, even taking a nap on the beach. Reluctantly left TL around 1 p.m. and headed back to PO to change and get ready for EPCOT. The first thing I noticed at EPCOT was the total lack of lines. Every ride was a walk on. It was fabulous. Saw HISTA. Thought it was good but wished there had been alittle less talk and more 3-D effects. Wandered down to The World Showcase and ended up in England. I�ve met a great many super nice people on the IRC in a channel called the #pub. Friendly and no foul language or mind games allowed. So I went into the Rose and Crown pub and had a Tennents extra lager and toasted the world in general. As I normally don�t drink at all, 1 pint of beer hit me like a hammer and Illuminations was the most vivid I can ever remember. I think I might have been conducting the orchestra at one point but I�m not sure about that. All I remember is that my husband was highly amused at my behavior. 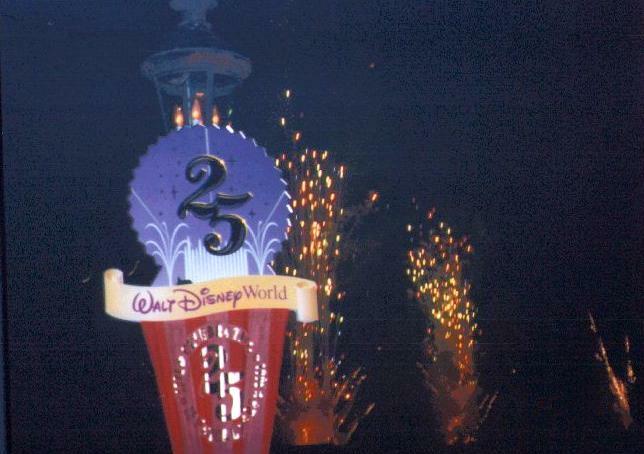 1996 marked the beginning of the Disney World 25th anniversary!